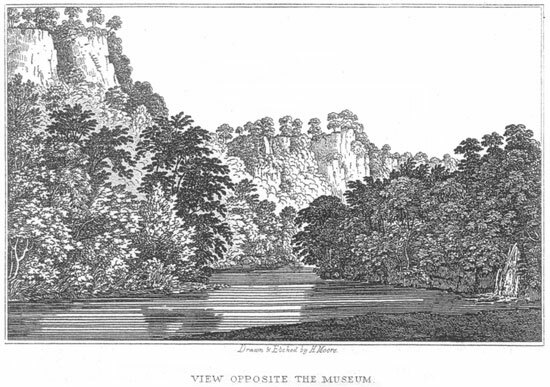 pp.32 - 36, with etching of "View Opposite the Museum"
the river, among some trees, that affords some pretty close scenes, a lofty craggy rock being occasionally seen through the trees. Near the place of landing, on the other side the water, is an alcove and a spar shop. A walk of considerable extent winds along the margin of the river, which is sometimes so completely embowered with trees, as scarcely to admit a glimpse of the stream: at others, a fine promontory of grey rock is seen through the opening branches, and the path is gradually lost in the wood. A small cascade is also seen falling into the dark river, which is a pleasing object; and the old alcove, a Gothick arch of rude stones, patched with moss, and over-grown with weeds, is become naturalised to the scene. This walk is terminated up the river by an abrupt rock, down which hang the pendulous branches of trees, that clothe the upper part of it, waving with the gentlest breezes that sweep the dale. The High Tor is here seen profile-ways, and harmonizes well with the rest of the scenery. The other extremity of this walk is bounded by a fence wall, which separates it from Mr. Arkwright's private walks. Near, is a small cavern, festooned with ivy, and overhung with trees; it is a romantic little scrap. From this walk others are seen branching off, that wind up the steep acclivity, among innumerable trees, and Iead under impending crags of grey limestone curiously veined with chert, and decorated with creeping ivy, and large-trees nodding on their summits: the path still winds, until we finally reach the top of the cliffs, where a powerful contrast is suddenly produced, by the appearance of fine fields of grass that gently slope from the very edge of the precipice. The High Tor now appears a prominent object in the scene, having a very different appearance to any object in the valley. The whole line of the back part of the eminence is seen declining from the edge of the rocks, the ground is strewed over with the refuse of mines, and its aspect altogether is extremely rugged. The road, the river, and the woods, with a stretch of distance, form a fine view. Keeping along the edge of the precipice, which is skirted with large trees, several fine peeps down into the valley are obtained, from different bold promontories; another path will also be found, by which the steep may be descended by a different rout. The day being uncommonly fine, many parties were attracted to this place by the refreshing coolness of these retired shades, which gave a pleasing animation to the scene.
" Welcome ! ye shades, ye bowery thickets ; hail ! Ye lofty pines, ye venerable oaks ! Delicious is your shelter to the soul." by foreigners, who have eagerly sought it, and in their writings pronounced it to he the most beautiful production of the mineral kingdom. Indeed the choice specimens of it that are here exhibited, verify what they have advanced in its praise ; and, as it is now become rare, the nobility of this kingdom begin to appreciate its importance as a gem; it therefore finds the way into their most splendid apartments, and their cabinets. It is also selected for presents to their foreign friends : nor could they select, from the productions of this country , any thing that is so highly esteemed by strangers. The various elegant ornaments, &c. of black marble, display considerable taste and skill in their execution; it bears a very high polish, and is enriched in a peculiarly embossed manner with figures, arabesque, and other ornaments. The black marble is procured from his Grace the Duke of Devonshire's Derbyshire estate, near Ashford. There are many other articles in this museum that are very interesting, but to enumerate all or them would too much extend the size of this publication.